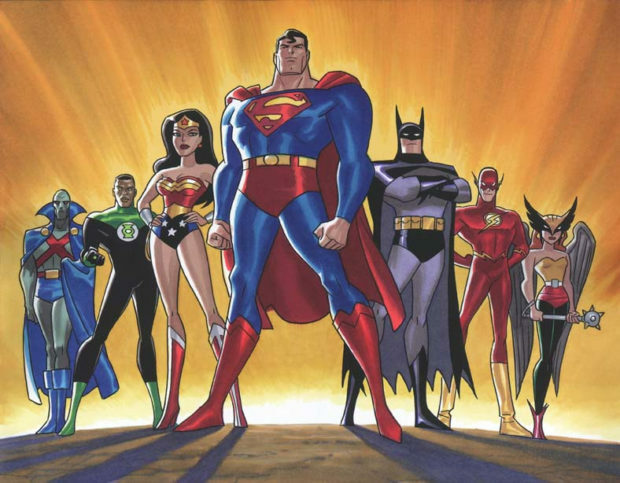 Now that the debut has happened, the hype has settled and we’ve all had a chance to see what Bruce Timm and Cartoon Network has done with our favorite group of DC superheroes, we can unbiasedly evaluate the show without sounding like drooling fanboys. This week brings us a two part installment titled In Blackest Night. You’d have to be a fool or a Marvel fan (Bill Jemas on Line One – editor) not to know this story will focus on Green Lantern. 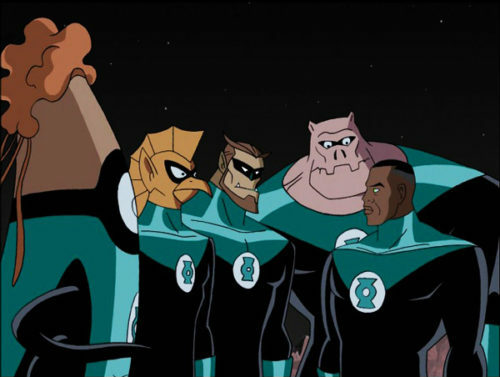 In the opening segment we see three Manhunters (the robots, not the Martians) given orders to retrieve John Stewart from Earth. Little do they know that John has chosen that day to take a stroll through his old neighborhood. He stops a liquor store robbery, shoots hoops with a kid, hangs out with the old timers at the barbershop and any other cliché that you could probably think of. Meanwhile up in the JL Watchtower Flash tests his best come-on lines on Hawkgirl. She shoots him down just in time for J’onn J’onzz to inform him that something is entering Earth’s atmosphere. Hawkgirl, Flash, and J’onn follow the UFOs down to Coast City (it’s a guess). The trio confronts the robots, the robots say they have come for John Stewart, a fight breaks out, and animated violence ensues. Superman shows up halfway through (he was busy with an earthquake) but the fight doesn’t end until John arrives on the scene. The Manhunters demand his ring and with a heavy head, he agrees. The robots take him back to their planet. The rest of the Justice League give each other the “what’s up with that?” look. An angry mob, some pissed off members of the Green Lantern Corps and a courtroom await John upon his arrival. The blue skinned Guardians watch the proceedings via interstellar Court TV and decided not to interfere. He’s clearly portrayed as the powerhouse of the group. Only Supes is able to make a dent in the fight against the Manhunters. Typical Superman, but the way they are drawing his face really bugs me. I know they are trying to make him look older but it’s just not blowing my cape, if you know what I mean. He has yet to show up this week. When J’onn asked if he wanted to investigate the UFOs, his response was “I’m busy.” Kids need to learn early on that Batman is sometimes a loveable a**hole. We learned a lot about Flash this week. He’s very young and my guess would be new to his powers. He doesn’t seem to know all the speed tricks yet and doesn’t know how to fly the JL spaceship. About the only thing he does know how to do is hit on Hawkgirl and he’s pretty bad at that. While I do like the way they’ve established Wally, which is pretty close to the way he was in the Superman Adventures episodes, he really doesn’t seem all that fast. Sure, he’s fast, but he’s doesn’t come across as “the fastest man alive.” Right now, Flo Jo could easily take him. What she lacks in eyebrows, she makes up for in short temperedness. She throws the first punch in the Manhunters stand off and asks for a few minutes alone with Kanjar Ro to find out the truth. I like pushy women. Still no details about her mission on Earth or Thanagar. He’s the leader of the group and just like the real DC universe has more powers than you can shake a stick at. At the San Diego Comic Convention, Bruce Timm talked about how he was going to limit J’onn to just a few powers. So far, I’ve counted flight, shape shifting, super strength, telepathy, ability to become intangible. What’s missing? Heat vision? Ability to talk to the animals? We didn’t learn much about him this week but it’s only fair since most of the pilot was about him. Well, aside from being a Shaft wannabe in his regular life, we don’t learn as much as I’d hoped about GL this week. At least Timm and company have nodded to comics continuity, as accidental genocide has unfortunately been John Stewart’s defining moment. He still comes across as the dullest of the members, frontrunner in the “guy you don’t want to get stuck talking to at the Superheroes Ball” award. Maybe I’m wrong and we’ll find out he’s the League’s answer to Chris Rock in Part Two.